This case study was prepared with assistance from Dr. Carlos Ochoa. Since we have been discussing the relevance of case reports and providing tips on case report writing for new academic writers – we have written the following case report in the style advocated by McCarthy & Reilley (2000) using their case report worksheet to demonstrate the ease of doing so in this style. Since the previous presentation of dual-port thoracoscopy for decortication was missing essential materials, we are presenting a second case report. Abstract: The use of increasingly minimally invasive techniques for the treatment of thoracic disease is becoming more widespread. Dual and even single port thoracoscopy is becoming more frequent in the treatment of parapneumonic effusions and empyema. Clinical question/problem: the effectiveness and utility of dual port thoracoscopy for parapneumonic effusions. Analysis of literature review: Despite the increasing frequency of dual and single port thoracoscopic techniques, there remains a dearth of literature or case reports on this topic. Pubmed and related searches reveal only a scattering of reports. Summary: As the case report suggests, dual port thoracoscopy is a feasible and reasonable option for the treatment of parapneumonic effusion. 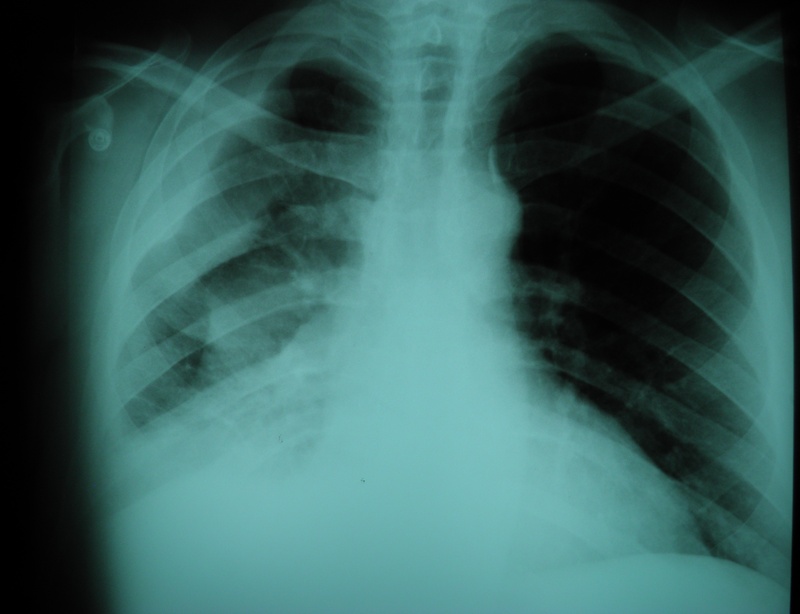 Case history: 50-year-old patient with a three-week history of pneumonia, with complaints of right-sided chest pain, cough and increased phlegm production. Additional past medical history is significant for poorly controlled diabetes, hypertension, and obesity with central adiposity. Medications included glyburide and lisinopril. After being seen and evaluated by an internal medicine physician, the patient was started on oral antibiotics. After three weeks, when his symptoms failed to improve, he was referred by internal medicine to thoracic surgery for out-patient evaluation. On exam: middle-aged obese diabetic gentleman in no immediate distress, resting comfortable in the exam room. Face appeared moderately flushed, but skin cool and dry to the touch, no evidence of fever. On auscultation, he had diminished breath sounds over the right lower lobe with egophony over the same area. The remainder of the exam was essentially normal. Lab studies showed a mildly elevated WBC of 11.6, decreased Hgb of 10.4 / HCT 32.5. Hemoglobin A1c 10.6, Fasting glucose 228, HDL mildly low at 40. EKG showed slight axis deviation, with slightly prolonged QRS complex (.16) with no evidence of loss of R, St elevation or other abnormalities. He was cleared by internal medicine for surgery. 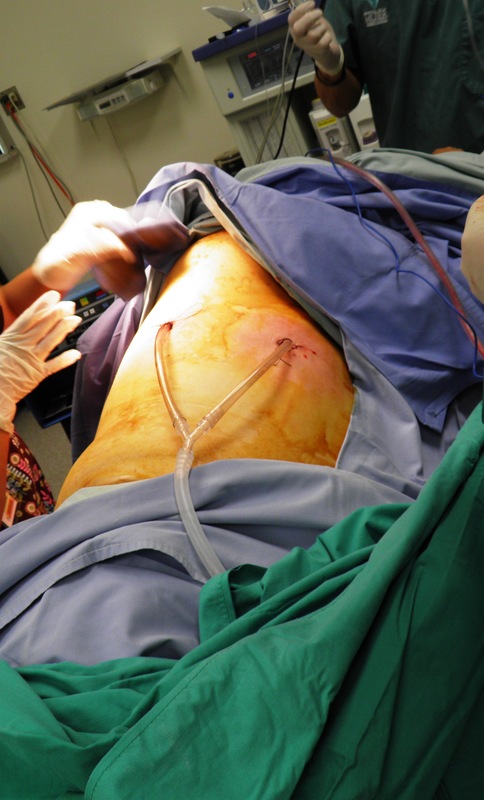 After risks, benefits and alternatives to VATS decortication were explained to the patient – the patient consented to proceed with surgical decortication. 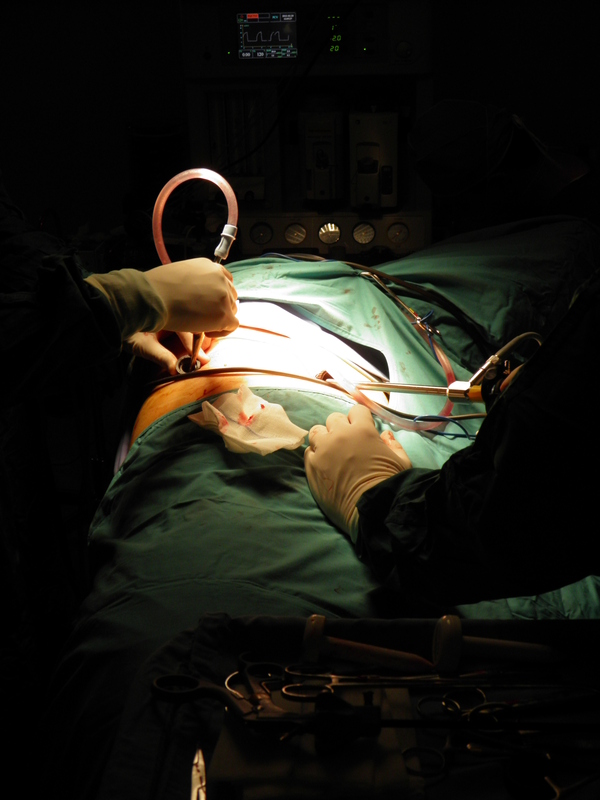 After scheduling surgery, the patient was seen by anesthesia in preparation for the procedure. Surgical procedure: Dual-port thoracoscopy with decortication of parapneumonic effusion. After being prepped and drapped in sterile fashion and confirmation of dual lumen endotracheal tube placement, a small 2 cm incision was made for insertion of a 10mm port. Following entry into the chest with the thoracoscope, the right lung was deflated for optimal inspection and decortication of loculations. After completing the majority of the procedure, a second access port was created for better visualization and to ensure that a thorough decortication was completed. The lung and pleural were separated from the chest wall, and diaphragm, and demonstrated good re-expansion with lung re-inflation prior to completion of the procedure. At the conclusion of the procedure, two 28 french chest tubes were placed in the existing incisions. These were sutured into place, and connected to a pleurovac drainage system before applying a sterile gauze dressing. The patient remained hemodynamically stable throughout the case, with no episodes of hypoxia or desaturation. Following surgery, the patient was transferred to the PACU in stable condition. Post-operative course was uncomplicated. Chest tubes were water-sealed on POD#3 and chest tubes were removed POD#4, with the patient being subsequently discharged after chest x-ray. Results of search: A limited number of case studies (3) described thoracoscopic surgery with a single port. There was one case found describing cases conducted with two ports, and the majority of reports involved three or more access ports. While convention medical wisdom dictates a trial and error treatment approach with initial trial of antibiotic therapy followed by chest tube placement (Light, 1995), surgeons have long argued that this delay in definitive treatment places the patient at increased risk of significant morbidity and mortality (Richardson, 1891). Multiple recent reviews of the literature and research comparisons continue to demonstrate optimal outcomes with surgery based approaches versus antibiotics alone, TPA and tube thoracostomy. The ability to perform these procedures in the least invasive fashion (VATS versus thoracotomy approaches) defies the arguments against surgical intervention as advanced by interventionalists (radiologists and pulmonologists.) Successful decortication with the use of dual port thoracoscopy is another example of how technology is advancing to better serve the patient and provide optimal outcomes, and offers a minimally invasive option when single port surgery may not be feasible. During the case above, visibility and access to the thoracic cavity was excellent. However, in cases requiring additional access, reversion to the standard VATS configuration can be done easily enough with significant delays or additional risks to the patient. Gonzalez – Rivas, D., Fernandez, R., De la Torre, M., & Martin – Ucar, A. E. (2012). Thoracoscopic lobectomy through a single incision. Multimedia manual cardio-thoracic surgery, Volume 2012. This is an excellent article which gives a detailed description, and overview of the techniques used in single incision surgery. Contains illustrations, full color photos and videos of the procedure. Gonzalez-Rivas D, Paradela M, Fieira E, Velasco C. (2012). Single-incision video-assisted thoracoscopic lobectomy: initial results. J Thorac Cardiovasc Surg. 2012 Mar;143(3):745-7. Gonzalez-Rivas D, de la Torre M, Fernandez R, Mosquera VX. (2011). 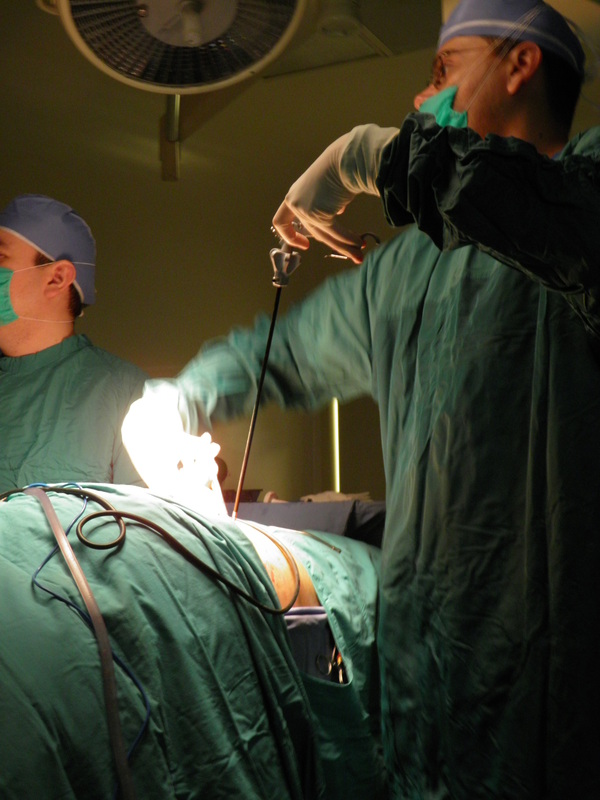 Single-port video-assisted thoracoscopic left upper lobectomy. Interact Cardiovasc Thorac Surg. 2011 Nov;13(5):539-41.